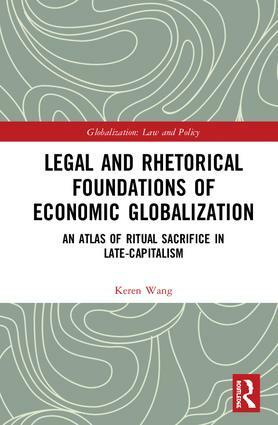 This book examines the subtle ways in which rhetorics of sacrifice have been re-appropriated into the workings of the global political economy in the 21st Century. It presents an in-depth analysis of the ways in which ritual practices are deployed, under a diverse set of political and legal contexts, as legitimation devices in rendering exploitative structures of the prevailing political-economic system to appear inescapable, or even palatable. To this end, this work explores the deeper rhetorical and legal basis of late-capitalist governmentality by critically interrogating its mythical and ritual dimensions. The analysis gives due consideration to the contemporary incarnations of ritual sacrifice in the transnational neoliberal discourse: from those exploitative yet inescapable contractual obligations, to calendrical multi-billion dollar 'offerings' to the insatiable needs of 'too-big-to-fail' corporations. The first part of the book provides a working interpretative framework for understanding the politics of ritual sacrifice – one that not only accommodates multidisciplinary, interdisciplinary knowledge of ritual practices, but that can also be employed in the integrated analysis of sacrificial rituals as political rhetoric under divergent historical and societal contexts. The second conducts a series of case studies that cut across the wide variability of ritual public takings in late-capitalism. The book concludes by highlighting several key common doctrines of public ritual sacrifice which　have been　broadly observed in its case studies. These common doctrines tend to reflect the rhetorical and legal foundations for public takings under hegemonic market-driven governance. They define 'appropriate and proper' occasions for suspending pre-existing legal protections to regularize otherwise transgressive transfers of rights and possessions for the 'greater good' of the economic order. Dr Keren Wang is a Postdoctoral Teaching Fellow in Communication Arts and Sciences with The Pennsylvania State University, USA. His research focuses on convergences and fractures among different systems of belief that underpin contemporary rhetorics of unity and division. He has published journal articles and book chapters on topics covering transnational rhetoric, global citizenship, knowledge-production, human rights discourse, rhetorics of law and religion, and constitutional legitimacy. Globalization: Law and Policy builds an integrated body of scholarship that critically addresses key issues and theoretical debates in comparative and transnational law. Volumes in the series focus on the consequential effects of globalization, including emerging frameworks and processes for the internationalization, legal harmonization, juridification, and democratization of law among increasingly connected political, economic, religious, cultural, ethnic, and other functionally differentiated governance communities. Legal systems, their harmonization and incorporation in other governance orders, and their relationship to globalization are taking on new importance within a coordinated network of domestic legal orders, the legal orders of groups of states, and the governance frameworks of non-state actors. These legal orders engage a number of important actors, sources, principles, and tribunals”including multinational corporations as governance entities, contract and surveillance as forms of governance that substitute for traditional law, sovereign wealth funds and other new forms of state activity, hybrid supra national entities like the World Bank and the International Monetary Fund, and international tribunals with autonomous jurisdiction, including the International Criminal Court, the World Trade Organization, and regional human rights courts. The effects have been profound, especially with respect to the role of states, and especially of the United States as its long time position in global affairs undergoes significant change. Comparative and transnational law serve as natural nexus points for vigorous and sometimes interdisciplinary approaches to the study of state and non-state law systems, along with their linkages and interactions. The series is intended as a resource for scholars, students, policy makers, and civil society actors, and includes a balance of theoretical and policy studies in single-authored volumes and collections of original essays.